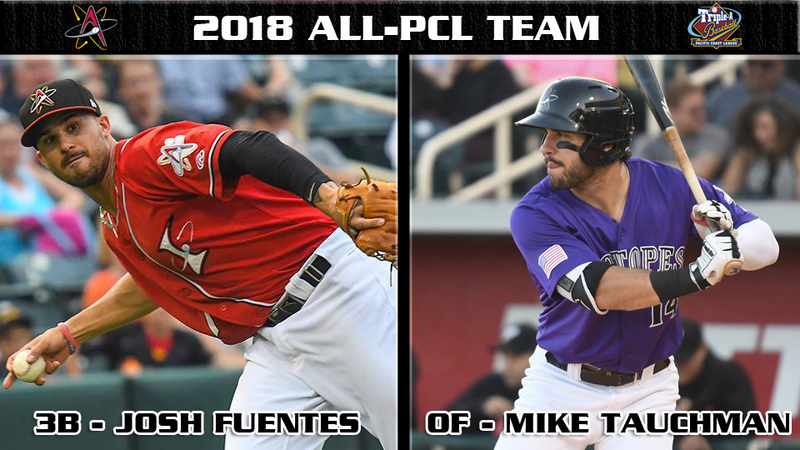 The Pacific Coast League has announced that Albuquerque Isotopes outfielder Mike Tauchman and third baseman Josh Fuentes have been named to the 2018 All-PCL Team. Tauchman, 27, is in the midst of one his best seasons as a professional. At the time of his selection, the outfielder's .573 slugging percentage ranks second in the league to go along with a .409 on-base percentage which ranks fourth and a .326 batting average which ranks fifth. The Palatine, Ill. native leads the Isotopes with 55 walks and a .982 OPS and also ranks second on the team in hits (123), home runs (19), RBI (76) and total bases (216). This is the second time in as many seasons Tauchman has been named to the All-PCL Team. Fuentes, 25, has enjoyed much success during his first campaign in Triple-A. The third baseman leads the league in games played (127), at bats (520) and total bases (261) while ranking second in the circuit in doubles (32), extra-base hits (57), triples (57) and runs scored (85). Fuentes' 90 RBI rank third in the league while his .319 batting average is eighth-best. The Orange County native has proven himself valuable on both sides of the ball, leading the league with a .964 fielding percentage at the hot corner. Fuentes was voted the Isotopes best defensive player by his teammates in 2018. Tauchman and Fuentes become the 17th and 18th players in Isotopes history to be named to the All-PCL Team since the club's Inaugural Season in 2003. Both players were also selected PCL Mid-Season All-Stars in July.